The SR100 based on Intel® Haswell QM87 chipset, is powered by Intel® 4th generation Core™ i7/i5/i3 processor onboard. The SR100 can operate effectively in harsh environment under temp range from -40 to 70°C and is a perfect solution for military, transportation, factory automation and digital signage applications. SR100 is based on EBX form factor which features with stackable PCIe/104 and FPE expansions, on board Nano SATA(3.0)16/32 Giga Byte SSD and Swissbit XR-DIMM up to 8GB. It supports triple-display, 2 DP and 1 DVI-I, 2 GIGA LAN port, 4 USB (2 x 2.0, 2 x 3.0), 1 COM port and 2 mPCIe Expansion slots (one co-layout with mSATA). SR100 supplies wide power voltage from 9 to 36V DC-in. PERFECTRON implements unique cooling solution on SR100 to achieve maximum heat dissipation with copper heat spreader, pure copper heat pipe and aluminium heat sink. With the aluminium heat sink enclosure allows dual-sided heat dissipation. We especially adopt the physical property of copper and aluminium, the copper heat spreader touches the heat source – processor and chipset and absorbs the heat rapidly, the heat then transfer to heat pipe; heat pipe is two-phase heat transfer involves the liquid-vapor phase change of a working fluid, the aluminium heat sink dissipates the heat into surrounding air promptly. With the benefits of fanless design, SR100 can ensure high reliability and stability while working under wide range temperature from -40 up to 70°C. SR100 is designed to meet MIL-STD-810G standard for shock and vibration. MIL-STD-810G standard is considered the upmost principle, which guarantees the system achieves superior quality and stability when operate under extreme harsh environment. We have conducted the test with series of testing procedures for resistance to shock, vibration, dust, humidity, and extreme temperatures. 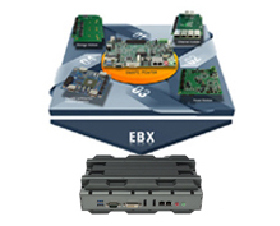 What’s more to make the system more rugged is SR100 designed with EBX form factor and stackable ability. With those two features can provide maximum exceeding solidity when stacking together to prevent loose from vibration. With key components- CPU and SSD soldering on board to enhance the capability of shock and vibration. 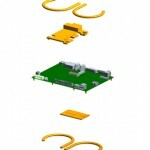 Known for application ruggedness, reliability, sealing properties, and compactness characteristics, PCIe/104 & FPE connectors are ideal for high-end electronic equipment and use in extreme environment conditions. With easy connect/disconnect and blind mating, SR100 has a functional life greater than 10,000 mating cycles. 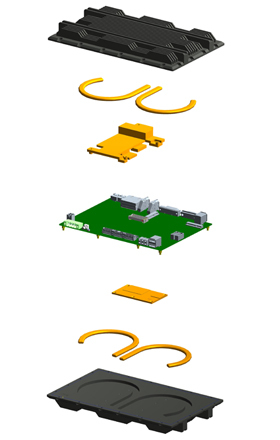 The PCIe/104 connector on SR100 that specifies standard of SAMTEC Q2™ QMS/QFS series in a three bank (156-pin) orientation for module stacking. SAMTEC designed the QMS/QFS series with a 15.24 mm stack height for top and bottom board stacking. And the Q2™ has triple the wipe of many high-speed mezzanine interconnects making SR100 the best choice for tough environmental conditions. 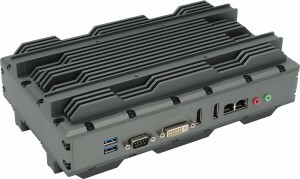 OXY5737A is based on EBX rugged single board computer, powered by Intel Ivy Bridge i7-4700EQ quad core processor plus QM87 chipset soldered onboard. With processor soldering on board can enhance the resistance of shock and vibration to allow product operates under every possible condition. With processor solder on board would lower resistance and inductance at the connection enhance effective transmission that could guarantee better and more high frequency performance for the system. SR100 carries stacking PCIe 104 and FPE expansion slot, which allows the system with optional module connects ability to increase a variety of possibility for device, connects. SR100 can use with stackable storage module SK401. With SK401 storage module stacking on board can additionally support 2x 2.5” SSD or HDD and 2x mSATA. The SK401 supports OS of Win 7, Win XP, Linux, DOS, etc. For certain application such like transportation and military always challenge the risk of unstable power that might cause damage to the system. Wide range DC input becomes an indispensable element for those applications. SR100 supports Wide range 9V~ 36V DC-in to protect system from damage caused by sudden surge or peak voltage. This feature guarantees the system increasing migration path flexible and eliminates redesign of existing power architecture. Copyright © 2019 - Sundance Multiprocessor Technology Ltd.